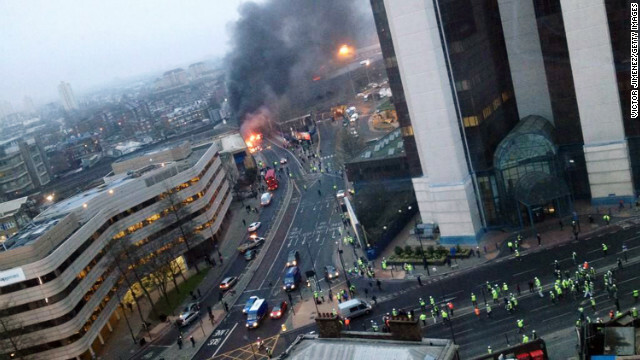 Smoke pours from the burning debris of a helicopter which crashed in the Vauxhall area. The helicopter appeared to hit a crane attached to the nearby St Georges Wharf Tower before plunging into the road below during the morning rush hour. Londoner Christopher Jen was at Vauxhall Tube station en route to his marketing job when he spotted smoke rising from an area nearby. A helicopter had clipped a crane atop a building and plunged to the ground, killing two people and injuring several others, police later said. "We could hear all the sirens and you could smell the smoke as the train went past the site," he said. "The station announcers did tell us that there was a helicopter crash at Vauxhall and the engineers had to go check the tracks before we could leave." 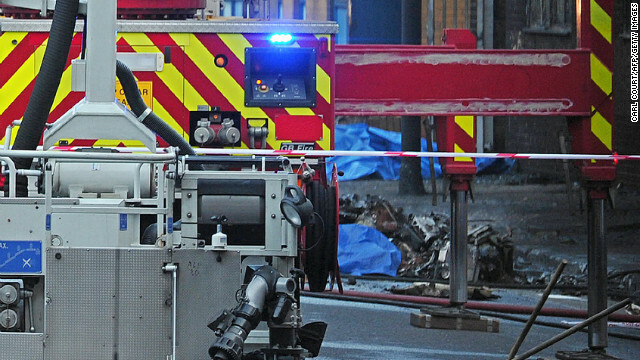 Debris is pictured beside a fire fighting vehicle at the scene of a helicopter crash. Emergency services at the scene after a helicopter reportedly collided with a crane attached to St Georges Wharf Tower in Vauxhall. Emergency services at the scene after a helicopter reportedly collided with a crane attached to St Georges Wharf Tower in Vauxhall, on January 16 in London, England. 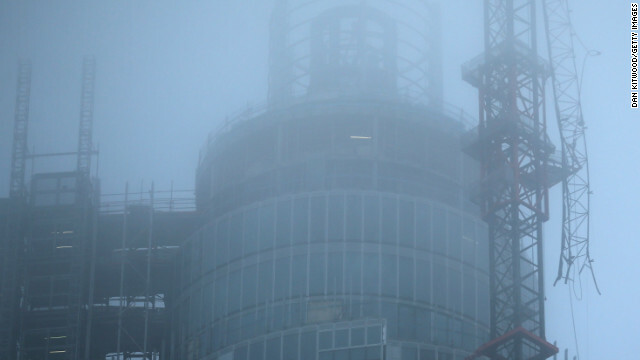 Fog surrounds a damaged crane attached to St Georges Wharf Tower after a helicopter reportedly collided with it. 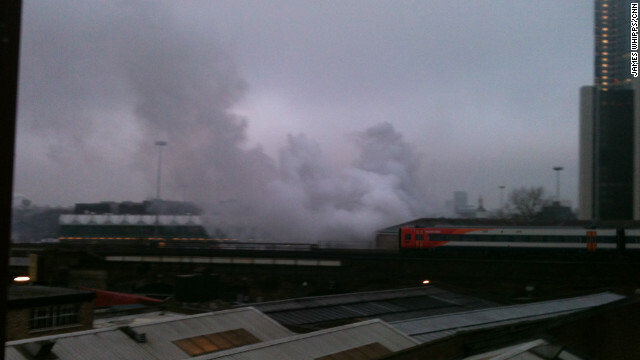 Smoke billows over central London's Vauxhall Cross area after a helicopter crash on the morning of January 16. 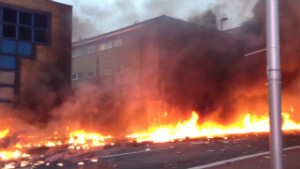 CNN journalist Nick Thompson shot this and other images of the aftermath of a helicopter crash in Vauxhall, London, that has left two people dead. Police: "It is something of a miracle that this was not many, many times worse"
Are you there? Send your pictures and video, but stay safe. London (CNN) -- A helicopter crashed into a construction crane atop a new luxury residential building in thick London fog Wednesday, killing the pilot and another person and sparking a line of flames as it plunged to the ground. Thirteen others were injured in the crash that took place near a busy intersection at the height of the morning rush hour in Vauxhall, south of the River Thames in central London. 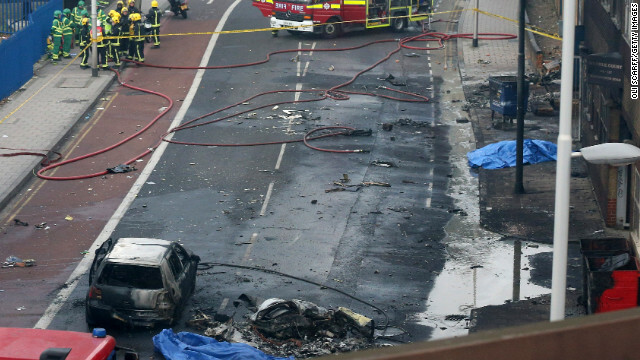 Thick smoke and flames billowed into the sky as traffic ground to a halt and emergency workers rushed to the scene, not far from landmarks like the London Eye and the Houses of Parliament. The bent crane dangled from the building top, prompting police to cordon off roads in the area and evacuate residents and office workers. Many watched, horrified, from the street and office windows as the drama unfolded. "I was standing outside having a cigarette when I saw the helicopter flying super fast towards the crane," said Rezart Islami, a builder who was working across the road from the 52-story building. "The pilot appeared not to have seen the crane because the helicopter hit it and went bang." 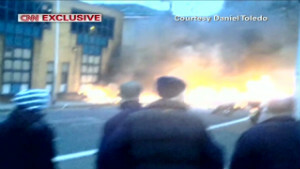 Islami said the rotor blade snapped off, and the copter spun to the ground and burst into flames. "The top off the crane also came off in the impact," he said. "It all happened so fast, it was unbelievable." 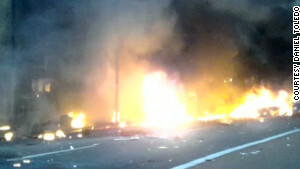 Another eyewitness recounted seeing rescuers pull three injured people from two burning cars. "It is something of a miracle that this was not many, many times worse given the time of day," said police commander Neil Basu. 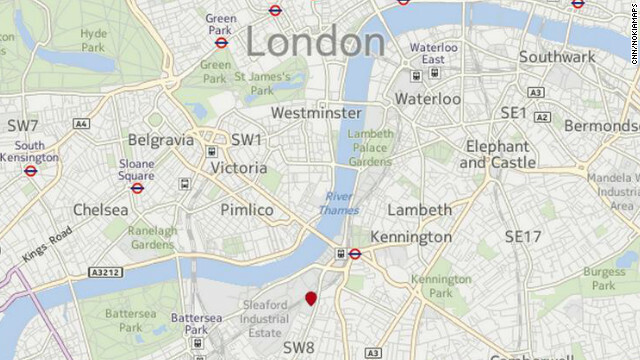 Vauxhall, not far from Westminster, is where a new U.S. Embassy is being built. The area, which is a mix of industrial, business and residential use, is also home to the riverside headquarters of the UK intelligence service, MI6. Rotormotion, a helicopter charter company, identified the pilot as Peter Barnes, 50, a married father of two. "He was one of the most highly qualified and highly skilled helicopter pilots in the UK, and his death is a great loss for the British aviation and his colleagues at Rotormotion," spokesman Paul Blezard said. "The thoughts of all the staff are with this family and two young children at this dreadful time." Barnes was the only person on board the helicopter, which was on a scheduled commercial flight from Surrey, southwest of London, police said. The second person killed "was in close proximity" to the helicopter, a London Ambulance Service spokeswoman said, but gave no more details. One of the injured was treated for a broken leg, but emergency responders said the others were not seriously hurt. Construction workers were at the site when the crash happened but were not hurt. James Whipps, a CNN producer, said the helicopter wreckage appeared to have landed on two cars by St. George Wharf, a major residential construction project. The St. George Wharf construction project includes the landmark St. George Wharf Tower, also known as the Vauxhall Tower. Its developers, the Berkeley Group, say it will be one of Europe's tallest residential towers. Whipps said he heard the sound of the helicopter rotors suddenly cut out. He did not see the impact, but as he looked though a window, he "suddenly saw this enormous fireball, black smoke, shoot up from the side of a building." Daniel Toledo heard "a big noise" while on his way to the nearby Vauxhall station. Though Toledo didn't see the helicopter at first, he took out his camera in time to shoot exclusive aftermath video for CNN. "I look up, after the helicopter down," said Toledo. "Big noise again. The helicopter is gone." 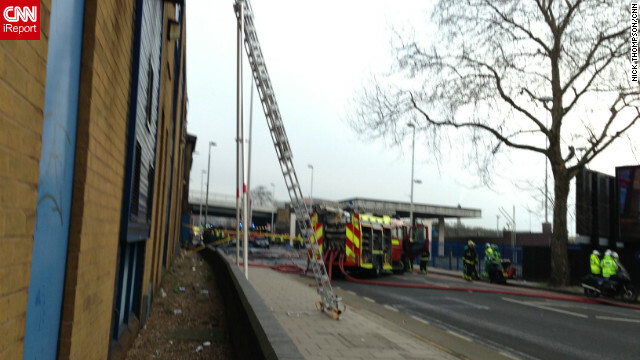 Nicky Morgan, a member of parliament, heard the impact from the nearby Vauxhall station. "There was an enormous bang and clouds and clouds of thick, black smoke," she told CNN. "It was very surprising, not what you expect to see." Despite the confusion, people remained calm, she said. Christopher Jen was at Vauxhall Tube station on his way to his marketing job when he spotted smoke rising nearby. "We could hear all the sirens and you could smell the smoke as the train went past the site," he said in a submission to CNN's iReport. "The station announcers did tell us that there was a helicopter crash at Vauxhall and the engineers had to go check the tracks before we could leave." Reporters allowed through the cordons to the deadly crash scene say little can be seen other than a dark spot where the helicopter hit the ground. A Berkeley Group spokesman said the firm was giving its full support to the emergency services after its crane was hit. "Our thoughts at this time are with the friends and families of those killed in this tragic incident," he said. Firefighters are now working with contractors to make the mangled crane safe. 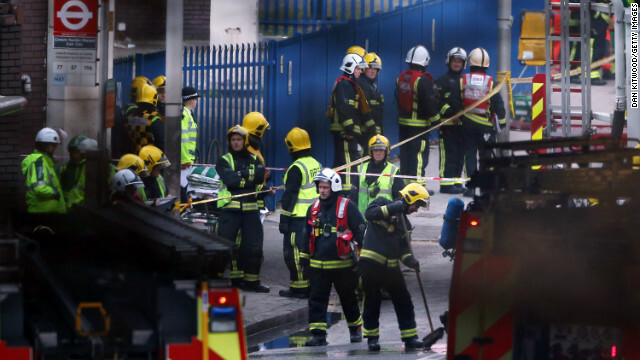 Prime Minister David Cameron thanked the emergency services for their "rapid and professional response." Many helicopters follow the Thames as a flight route through the city. This helicopter appeared to be flying farther south than usual, Whipps said. 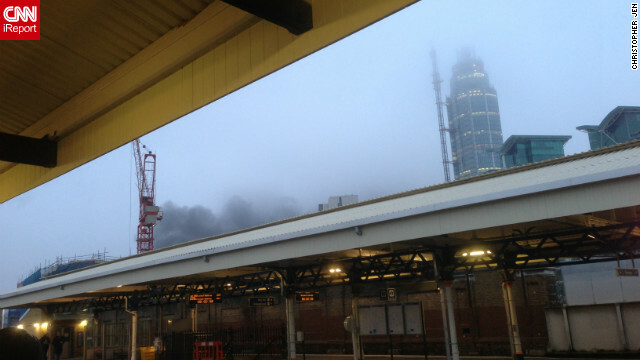 No cause has yet been given for the crash, but visibility was poor in London on Wednesday morning, with fog and a very low cloud ceiling. Chris Yates, an aviation security expert, told CNN it was likely there would be questions about whether the helicopter should have been flying in these conditions. Under safety regulations, tall buildings must have navigation lights on top to make them visible to low-flying aircraft, he said. Helicopters are not supposed to fly within 500 feet of tall structures in central London, he said. The London Heliport is near the crash site, on the banks of the Thames, at Battersea. The Air Accidents Investigation Bureau, part of the UK Department for Transport, has sent a team to investigate the crash. The Civil Aviation Authority says helicopters in London have only limited radar help and fly mostly using visual reference points on the ground. Certain designated routes for helicopters are in place to "provide maximum safety by avoiding flying over built up areas as much as possible," it says. Nearly 170 flights followed the central London route along the Thames in December, its figures show. About 250 flights arrived and departed from the heliport at Battersea in the same month. Wednesday's crash caused major disruptions for many people on their way to work. Vauxhall, with a rail station, Underground station and large bus station, is an important transit point for those traveling from the south to other parts of London. The Nine Elms area between Vauxhall and Battersea has been earmarked as a major regeneration site, with plans to create 16,000 new homes and 25,000 new jobs. CNN's Antonia Mortensen, Dominique Van Heerden, Sarah Brown, Saskya Vandoorne and Mark Morgenstein contributed to this report.